Singapore – The 2nd round of The New Paper (TNP) Bingo Giveaway takes on a new digital dimension with the launch of the Bingo application on Facebook! Deployed by digital creative agency noisycrayons, this is the first time that the wildly popular TNP Bingo contest is going digital. With a cash pot of S$35,000, the campaign aims to introduce a social-digital spin to keep the game fresh for TNP readers, as well as attract new readers who are frequently on social media. In addition to earning the cards via a purchase of TNP, readers can earn 3 virtual Bingo Cards by introducing the contest to friends on their social network. Readers are required to match numbers on the virtual card with those printed in copies of TNP for the week to win cash and home electronic sets. 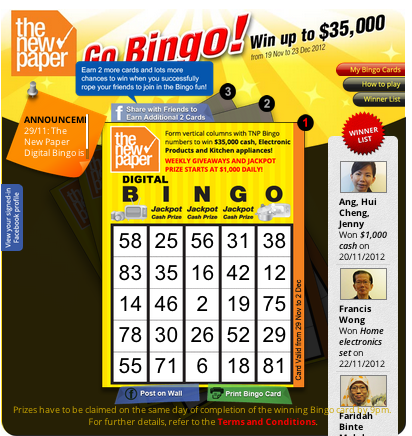 The Facebook Application for TNP’s digital Bingo Giveaway is developed by noisycrayons.